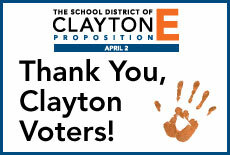 Thank you, Clayton voters, for approving Proposition E! The ballot measure passed with 64.2 percent of the votes cast in the April 2, 2019, election. The community's support of Proposition E will have a lasting impact on our schools and our students by providing the needed funding for the District to maintain and strengthen its academic excellence and fiscal stability. 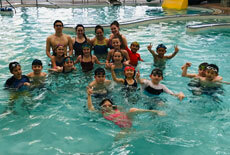 The third-graders at Glenridge Elementary learned from a very talented group of swim instructors when they took part in the annual swim safety and instruction field trip to The Center of Clayton in early April. Click on the headline to learn more and view photos. 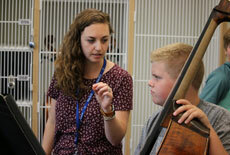 The School District of Clayton is one of three districts in the state to earn the Best Communities for Music Education designation from The NAMM Foundation for its outstanding commitment to music education. Click on the headline to learn more. Meramec Elementary fourth-graders hosted a Poetry Cafe for their parents and teachers on Thursday, March 7, to present their social justice poem ebooks. Click on the headline to learn more and view photos. 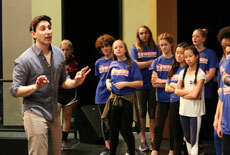 On the day before the debut of the Wydown Theatre Company’s production of “Newsies: The Musical,” the cast took part in a master class with a very special guest: Ben Fankhauser, a member of the original Broadway cast of “Newsies.” Click on the headline to learn more and view photos. Clayton High School sophomores took part in an in-school field trip to learn and explore the essentials of the Vietnam War at Clayton High School’s 12th annual Vietnam Day on Thursday, March 14. Click on the headline to learn more and view photos. 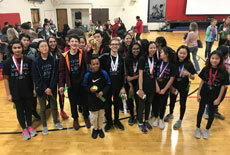 The Wydown Middle School Varsity Science Olympiad Team earned second place at the Regional competition held on Feb. 23, while the Junior Varsity Team placed fourth. Click on the headline to learn more. 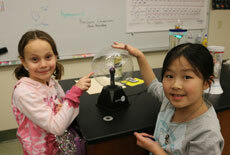 Clayton students, families and community members convened at Clayton High School on Saturday, March 2, for the District's annual Science Fair. Click on the headline to view photos and the list of winning projects. The School District of Clayton’s Principles of Teaching and Learning guide leaders, schools, departments, teams of teachers and individuals when making decisions related to curriculum, pedagogy, assessment and professional learning. These principles inform the teaching and learning process in the classroom, the implementation and evaluation of the written and taught curriculum, and remind us of our own educational expectations. We see a direct connection between these Principles of Teaching and Learning, the Standards of Professional Practice and Standards of professional learning within the District. Our District mission, vision and core values anchor these principles. Committing to collective inquiry, evidence-based decision-making, innovation and reflection of the results of teaching and learning. Empowering students to take ownership in their own learning. Measuring student learning through multiple assessments and using data and information to monitor and improve student learning. Providing ongoing, specific feedback to students as a part of regular instruction. Monitoring student progress to guide instructional decision-making. Partnering with parents, students and other educators to create environments that support individual and collaborative learning. Building individual motivation and social interaction for purposeful engagement in learning. Promoting self-reflection that results in improved learning. Supporting the development of teachers’ craft and content expertise. 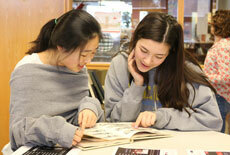 Engaging in dynamic and challenging content related to local, regional and global issues. Guiding deep understandings of content areas and their connections to one another in order to synthesize skills and communicate knowledge in meaningful ways. Nurturing understanding and communication of ideas while participating in intellectual endeavors. Ensuring that curriculum, instruction, and assessment are dynamic, intellectually stimulating, developmentally appropriate, grounded in research and attentive to the range of student learning needs. Understanding diversity to ensure inclusive learning environments that enable each learner to meet high expectations. Ensuring that our curriculum is a place where students can explore the unfamiliar, but also see their own lived experiences validated and valued. Engaging in opportunities that offer choice and exploration that require critical thinking, creativity, and collaborative problem solving. Attending to the varied learning needs of students through instruction and assessment that are dynamic and intellectually challenging. Acknowledging that to be truly innovative one must take risks in teaching and learning as a part of an authentic avenue of learning. Providing leadership and growth opportunities. Supporting professional learning through thoughtful, informed opportunities. Upholding our mission, vision, core values and strategic goals. Learn more about each coordinator by clicking on his/her name below.